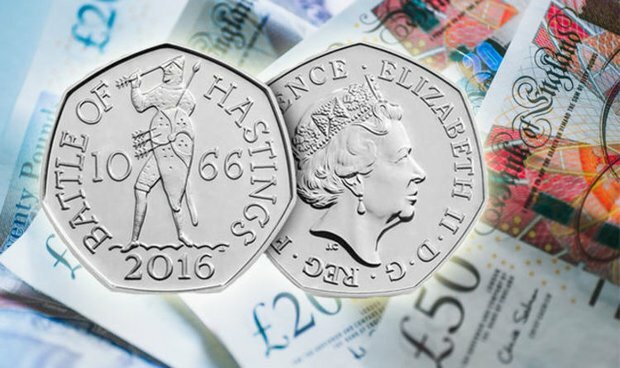 The rarest and most valuable coins out there right now – from 50p to £2. Websites like ChangeChecker.org – a resource for coin collectors in the UK – run trackers than calculate the median price of recent eBay auctions to determine which coins are most valuable to collectors at any given time. A 50p released to commemorate 250 years of Kew Gardens in 2009 is the coin in current circulation likely to fetch you the most money if you’re lucky enough to find one in your change. It depicts the Gardens’ famous pagoda on one side, and only a relatively small batch of 210,000 were minted, meaning you can now expect around £80 for one. These £2 coins are the result of the slipping of a piece of the Royal Mint’s machinery during the striking process. If the Queen’s head on your coin is rotated by around 150 degrees in relation to the back side (which features an image of Britannia), you could be in possession of a coin with a collector’s value of around £75. These 50p pieces were released in the early ’90s to celebrate the European Economic Community, and depict 12 stars to represent the member states of the EU at that time. Often regarded as the jewel in the coin collector’s crown, the undated 20p is the one coin every change collector wants to get their hands on.